George Long site - georgelong's JimdoPage! Sometimes referred to as a 'Jazz Painter', his paintings convey a rhythmic feeling deep in emotions. Drawing inspiration from American and German expressionists, Long incorporates spontaneous abstract brush strokes with more suggestive human and natural forms and figures. Thus, the viewer is transported from the familiar into the unknown. His paintings express the free and rebellious spirit of art in its purity. 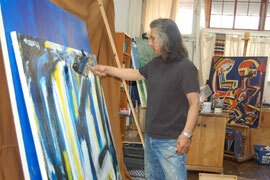 His paintings are in collections in the US, Canada and Europe.